Trailer dimensions Width 1360mm x height 1500mm x length 3800mm Loading area Width 1250mm x height 750mm x length 2500mm x (ca 2.5m3) Total weight 600kg Loading capacity 1500kg 7.5 hp electric start power pack Maximum reach of the crane 3.4m Maximum weight lifting at 3.4m 200kg Maximum weight lifting at 1.7m 350kg Rotator Baltrotors GR10 Rotation radius +/- 90O Rotation radius of the rotator infinite Grapple area 0.08m2 Maximum opening of grapple 750mm Oil pressure 160bar Tyres Low pressure tyres 22 / 11 – 8” Coupling 360 degrees rotary coupling for 50mm hitch ball Galvanized and powder-coated steel construction. 2 pairs of log bolster posts in standard kit (possible to add extra log bolster posts for smaller timber). 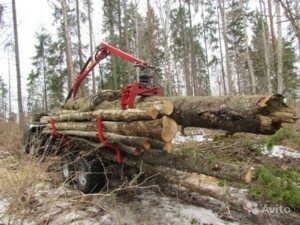 Log bolster posts can be moved on the main frame to adjust the load balance of the trailer. Suitable for transporting timber up to 5 metres of length. Most of the hydraulic distribution moves through the frame of the trailer, making for good protection against damage. Safe uploading of timber provided through hydraulic support legs. Watch video here (shows optional 4wd and winch) For product literature click here You will need adobe acrobat to open the file.